10 Pack of One Direction Masks, as they were then and as they are now. 2 Pack - Beyonce & Jay Z Masks. Catfish Masks - Nev & Max. 2 Pack - Chas & Dave Masks. Chas Hodges and Dave Peacock. Chris Hughes and Kem Cetinay Love Island Masks. Holly Willoughby and Declan Donnelly Masks. 2 Pack - Dolly Parton & Kenny Rogers Masks. Country Singers. 2 Pack - Mark Heap Masks - Jim from Friday Night Dinner. 2 Pack - Now & Then - Aled Jones, welsh singer, walking in the air, and tv presenter. 2 Pack - Oasis Noel and Liam Gallagher from Oasis in his new group Beady Eye, great fun for parties. 2 Pack - Ryan Thomas and Roxanne Pallett Masks. Celebrity Big Brother 2018. 2 Pack - Suspected Russian Spies Alexander Petrov and Ruslan Boshirov Masks. Chuckle Brothers Barry and Paul. Dusty Hill and Billy Gibbons- ZZ Top Singer Masks. An updated 2012 Queen Of England Royal Mask. Great fun for parties and celebrations. 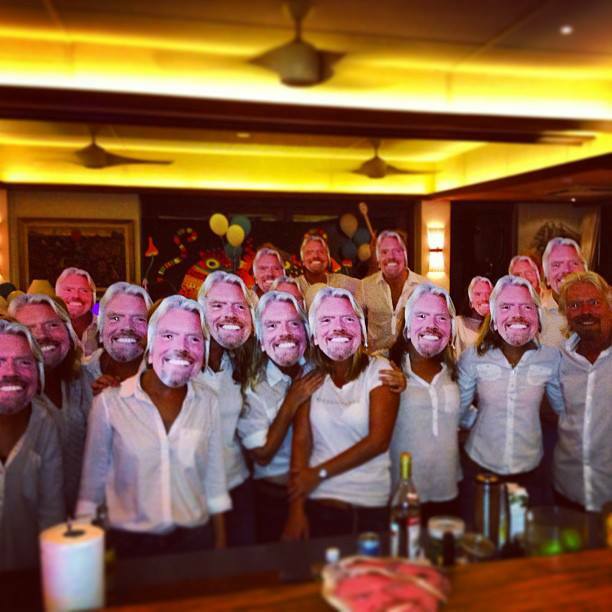 2013 Richard Branson's Birthday Party - The real Richard Branson is the one on the far right. Will you be given the job of the hardest worker or will it be a total disaster and you get fired?! Have fun with this high quality Alan Sugar Mask, whether it's at home, at a party or a work do it's sure to put a smile on everyone's face! 4 Pack - Blue Boy Band Masks - Antony Costa, Duncan James, Lee Ryan and Simon Webbe. Version number 5 of American business magnate Donald Trump 1980's Retro Mask. Fun for any occasion. 4 Pack Masks - Agnetha Faltskog, Anni-Frid Lyngstad, Bjorn Ulvaeus and Benny Anderson. 4 Pack - The Inbetweeners Masks. 4 Pack X-Factor Judges 2018 Masks. Great for any fancy dress party or concert. The fantastic singer Adele in all her glory. Great for parties! Sports commentator Adrian Chiles, great fun for any football event and parties. English Actor Aidan Turner, known for playing Ross Poldark, great for dinner parties and events. What is he like....! Yes it's our great Ainsley Harriet mask, Ready Steady Cook! How much of a chatty man are you? By wearing this high quality Alan Carr Mask you will find the conversation will flow. Have fun with this high quality Alan Carr Mask, whether it's at home, at a party or a work do it's sure to put a smile on everyone's face! Sports commentator Alan Hansen, great fun for any football event and parties. Alan Partridge - Steve Coogan Mask. Alan Shearer 1980s retro Mask, great fun for any football event and parties. Sports commentator Alan Shearer, great fun for any football event and parties. Journalist and conservative spokesman Alastair Campbell. Great for any political party! Journalist and conservative spokesman Alastair Campbell. England cricketer Alastair Cook mask. Great fun for parties. 1980's version of Aled Jones. Great fun for parties and karaoke nights. Strictly Come Dancing and the wonderful singer that is Alesha Dixon. Great fun for any party or Karaoke night. Alex Ferguson football manager mask, great for any football fan. Alexander Armstrong, famous British comedian and host of Pointless, great fun for parties. Get your mates to show you their talents and judge them whilst wearing this high quality Amanda Holden mask! Why not team it up with Piers Morgan and Simon Cowell and put on a proper show! Great for parties too. Andrew Ridgeley Wham 1980 Style Retro Mask. Great for parties and karaoke nights. Andrew Sachs - most famously played Manuel in Fawlty Towers, great fun for any party. A great mask of Andrew Stone taking the world by storm.. But hurry Andrew himself may buy them all!. Andy Burnham - Labour politician.Great for political rallies and events. Become beautiful, intelligent and athletic and fulfill your partner's dreams by wearing this high quality Angelina Jolie mask! Great for parties too. Former Conservative politician mask of Ann Widdecombe. Great for political parties and Dance Offs! The Chases' Anne Hegerty Mask. Get ready to rumble with a celebrity in the jungle in this high quality Ant McPartlin Mask V2. Why not pair it up with his best mate Declan Donelly?Great for parties. Get ready to rumble with a celebrity in the jungle in this high quality Ant McPartlin Mask. Why not pair it up with his best mate Declan Donelly?Great for parties. Get ready to rumble with a celebrity in the jungle in this high quality Ant McPartlin Young Mask. Why not pair it up with his best mate Declan Donelly?Great for parties.